Flip out for this colorful card game of back-to-back excitement! Switch, swap, and flip cards in order to get at least four-of-a-kind in a row. Sounds easy, but the cards in your hand are not necessarily your own! Every card is double-sided, so anyone can take - and use- any card in sight. Collect the most cards and, nomatter how you look at it, you win! Just when we thought we had played every type of card game, along comes this one that literally flips everything inside out! Between the double-sided cards, the clever varieties of actions, and the easy-to-learn rules, this game has the perfect combination of elements that makes for hours of family fun. 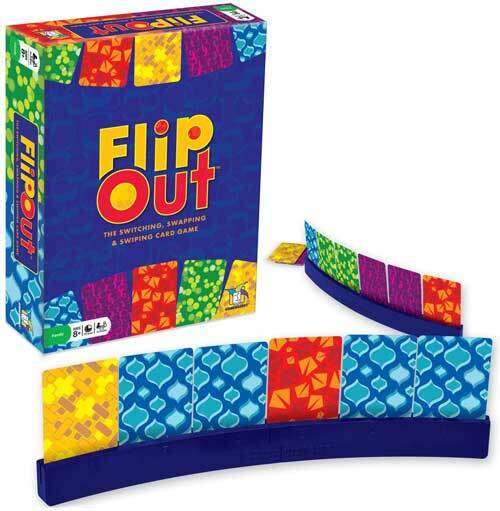 FlipOut, the game where there really are two sides to everything! Flip out for this colorful card game of back-to-back excitement! Switch, swap, and flip cards in order to get at least four-of-a-kind in a row. Sounds easy, but the cards in your hand are not necessarily your own! Every card is double-sided, so anyone can take ­ and use ­ any card in sight. Collect the most cards and, no matter how you look at it, you win!